People of all ages can traumatically injure a tooth but most traumatic dental injuries occur in children. Injuries may result from bad falls, participating in sports, bike or car accidents, etc. The severity and type of injury will determine the necessary treatment. There are a number of common injuries that can happen to teeth. Many of them affect the inner soft tissues of the tooth, known as the dental pulp. When the pulp becomes injured or inflamed, root canal treatment may be needed. Most chipped teeth can be fixed with a tooth colored filling if the chip does not expose the pulp. If the pulp is exposed, a sedative filling can be placed over the pulp and that might be the end of treatment. Other exposures, however, may require root canal treatment. Injuries to the back teeth often include fractured cusps, cracked teeth, and the more serious split teeth. Cracks may or may not extend into the root. If the crack does not extend into the root, the tooth can usually be restored with a full crown. If the crack does extend into the root and affects the pulp, root canal treatment is usually necessary in an attempt to save all or a portion of your tooth. During an injury a tooth may be pushed up into its socket. This is one of the more serious injuries. We will try to reposition and stabilize your tooth. Root canal treatment is usually started within a few weeks of the injury, and a medication, such as calcium hydroxide, may be put into the tooth. A rubber based root canal filling will be placed at a later date. This type of injury needs annual monitoring to make sure the treatment is working. During an injury, a tooth may be pushed partially out of the socket. 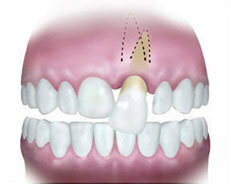 Repositioning and stabilizing the tooth are usually necessary. If the pulp remains healthy, no additional treatment may be needed. If a tooth is completely knocked-out of your mouth, time is of the essence. If this type of injury happens to you, pick up your tooth by the crown, or chewing portion. Try not to touch the root. If the tooth is dirty, gently rinse it in water. Do not use soap or any other cleaning agent. 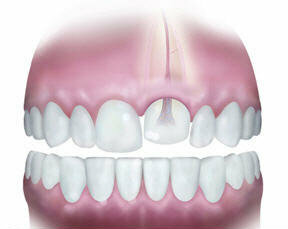 If possible, place the tooth back into its socket and call us immediately. Please see how to save a knocked out tooth for more information. Chipped teeth account for the majority of all dental traumas. Treatment depends on the type, location and severity of each injury. When any dental injury occurs, the most important thing is to let us know immediately. The outcome, or prognosis, for your specific injury often depends upon how quickly we can examine, diagnose, and treat the injury.